The Repair Directory is our tool to help people find a reliable repair shop in their local area. 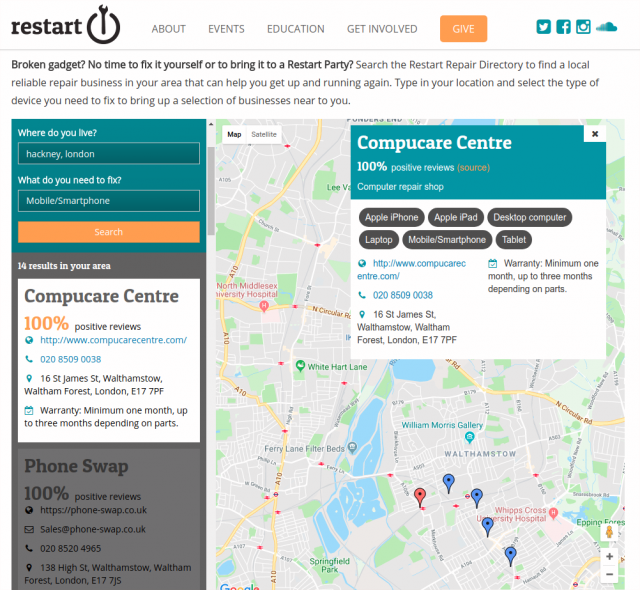 We are building a directory of local repair businesses, and making it simple for the public to find these businesses when they need an urgent fix to their gadget or device. You can use the repair directory here. We are growing the repair economy. We are active in community repair, encouraging and empowering citizens to use their devices for longer. But we recognise that community repair alone is not enough. Commercial repair is a key part of the repair economy. Yet the general public’s limited trust in repair businesses and the time currently required to find an appropriate repair option reduce the uptake of repair. Our research with Nottingham Trent University in 2016 shows that as yet only 33% of attendees at our repair events could name a reliable commercial repairer, indicating a lack of knowledge and a trust barrier. 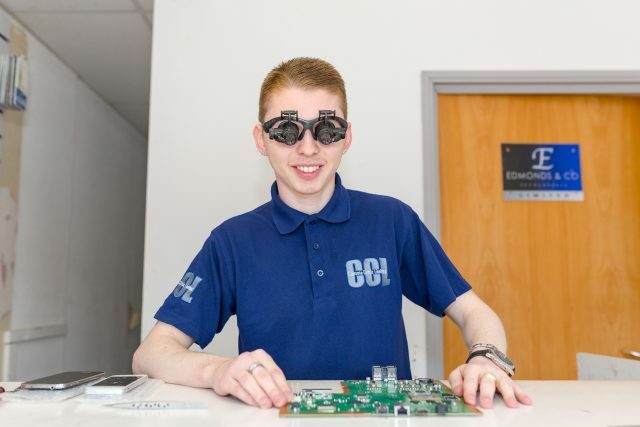 We constantly receive requests for advice on commercial repairers: for many people, access to a reliable service makes all the difference between repairing and buying a new product. Searching for a reliable repair businesses can be time-consuming and often frustrating – the Repair Directory aims to make it easier, and to grow the repair economy in the process. What is a reliable repair business? Disclaimer: we are fully aware that online reviews can be contested, or prone to manipulation. We consider “positive” reviews those that are 3/4/5 stars, and we currently cannot exclude potentially ‘fake’ reviews from this mix. The sources of our reviews are platforms such as Google, Trustpilot, Facebook, Yell, Freeindex and Checkatrade. Data on repair businesses is collected by researching them online, and by visiting the neighbourhoods in person to find additional businesses without a strong web presence. Key data about businesses is then entered in the backend of the directory, including the percentage of positive reviews a business has. Data is then verified and approved for publishing on the directory. As most of the work is currently done manually, it requires frequent updates to avoid listing businesses which might no longer meet the requirements (for example, in case their percentage of positive reviews dropped below the threshold we set). The current release of the Repair Directory is a beta release – this means it is not finished yet! We want to get feedback and involvement from the community on a number of things. Not least, to help expand and refine the list of businesses. Keeping the listings up-to-date is especially important. Currently data updates are performed manually. In the future we plan to improve the integration of the Repair Directory with the APIs of review sites, to make updates more timely. We also see an opportunity to collaborate with repair activists and volunteers running Restart Parties to capture and share their local insights into the repair economy. To enable this, we plan to include the Repair Directory into our Fixometer, creating a suite of tools that local groups can use to promote better use of resources in their area. You can help us grow the repair economy. Use the repair directory, and let us know what you think. Noticed a bug? Get in touch! Help us improve the list of businesses. Send us an email if you notice an error or omission, or with your own recommended business. Help us build the software. 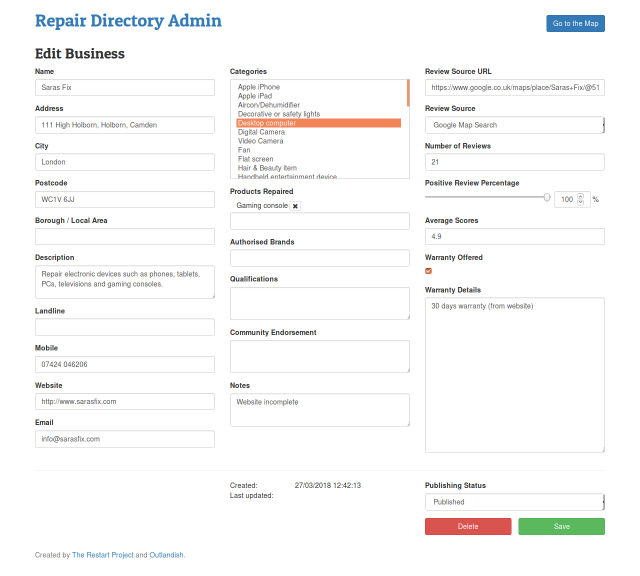 The Repair Directory is free, open-source software with the source code available on Github. If you’re a coder, a designer, a UX person, or a tester, you can get involved! And as always, you can keep up-to-date with our progress by following us on Twitter, subscribing to our newsletter, listening to our podcast and by watching out for updates here.